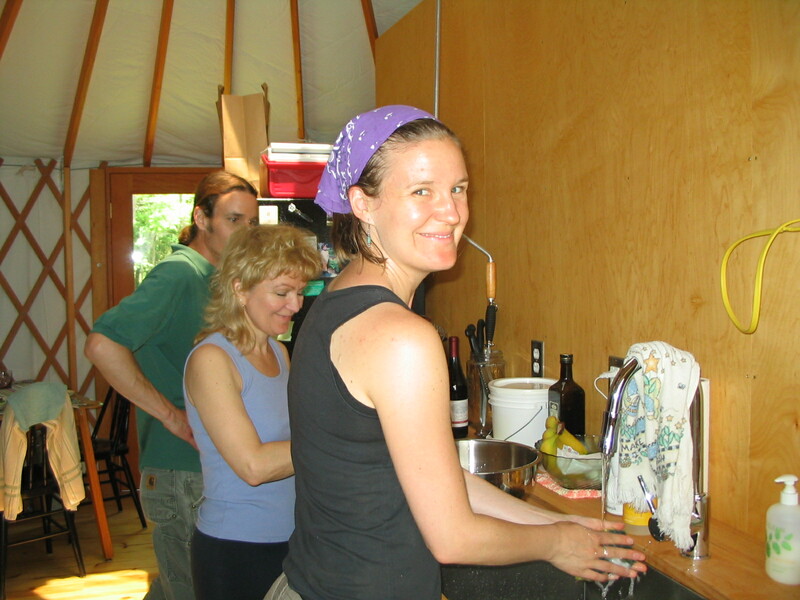 We are really loving living in the yurt, did I mention that before? 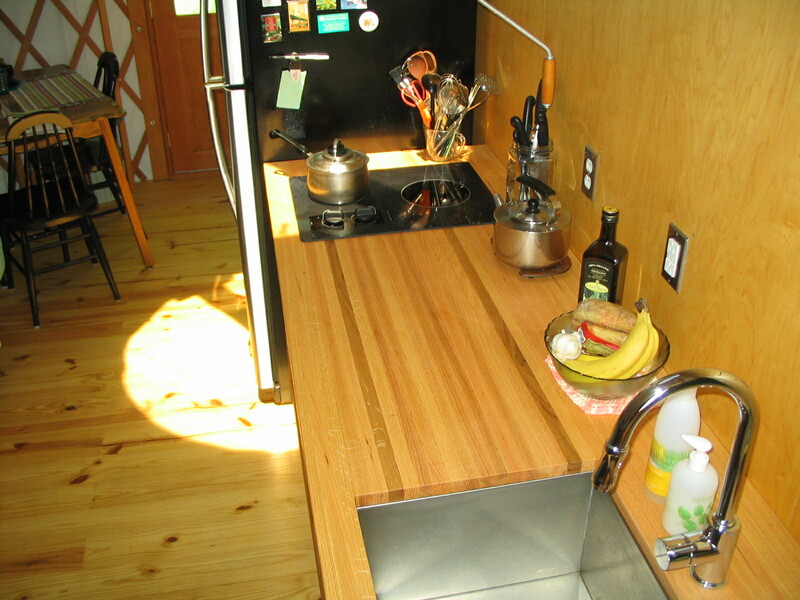 There are still many projects yet to be completed, but for the most part our living situation is very comfortable. 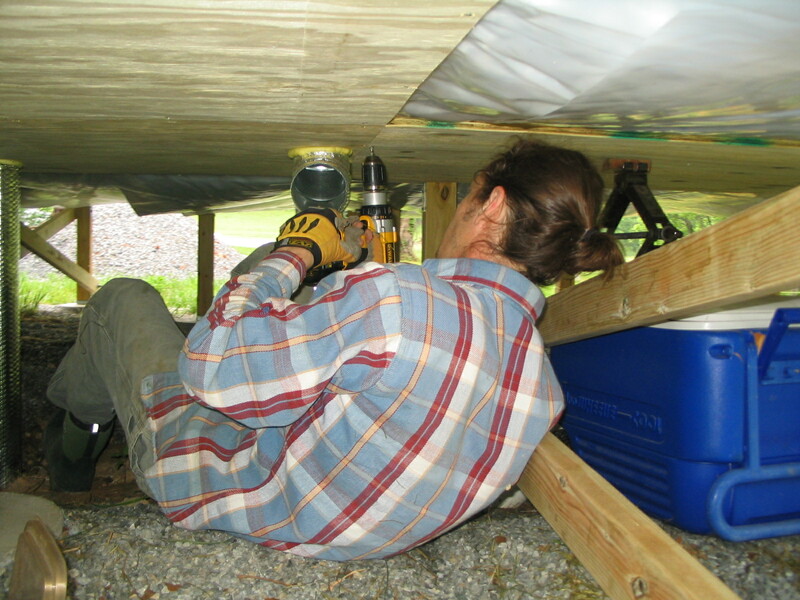 Gavin has been working on finishing up the insulation underneath the yurt so that this week we will be able to have the heat pump installed. And then we will have A/C and heat. It will be quite civilized. Here’s what the kitchen looks like. Small but functional. Once Gavin builds the upper cabinets we will have plenty of space. It’s great for one cook, but it can get a little crowded with several people trying to work. That’s okay; we don’t mind rubbing elbows a bit. Underneath the yurt, Gavin cuts the plywood to fit and screws it into the joists. It’s a pretty cramped space to work in. Today our friend Kathy O’Hara came to visit. We planted the peppers and eggplant. Thanks, Kathy! We are fortunate to have family and friends who are willing not only to drive all the way out here to visit, but then to get dirty working in the garden! We’re grateful! 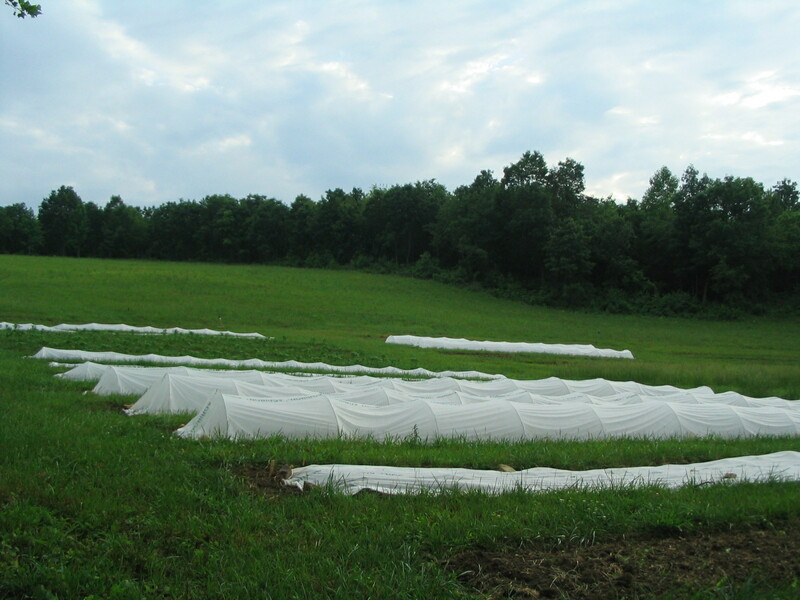 Lately we’ve been putting everything under these wire hoops to protect them with row cover. Mainly because we are worried about deer. I have seen their tracks in the potatoes, which are no longer under cover, but so far the deer have been detered from the covered rows. Today we ran out of hoops though, so hopefully the deer will stay away until tomorrow night when we can get more hoop-making wire. 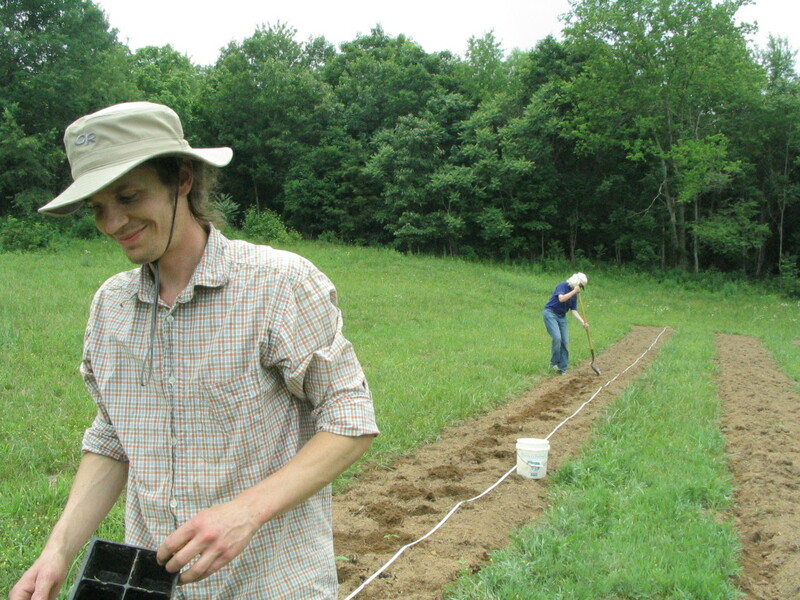 The long-term goal is to have an 8 foot fence of woven wire around the field, but for now this is the solution. 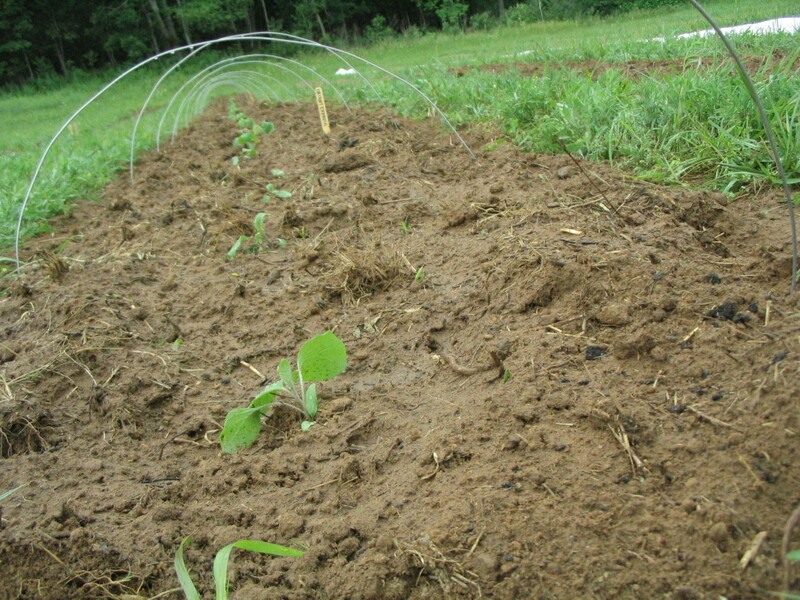 That is, until the plants out-grow the 1 1/2 feet of space under the hoops! 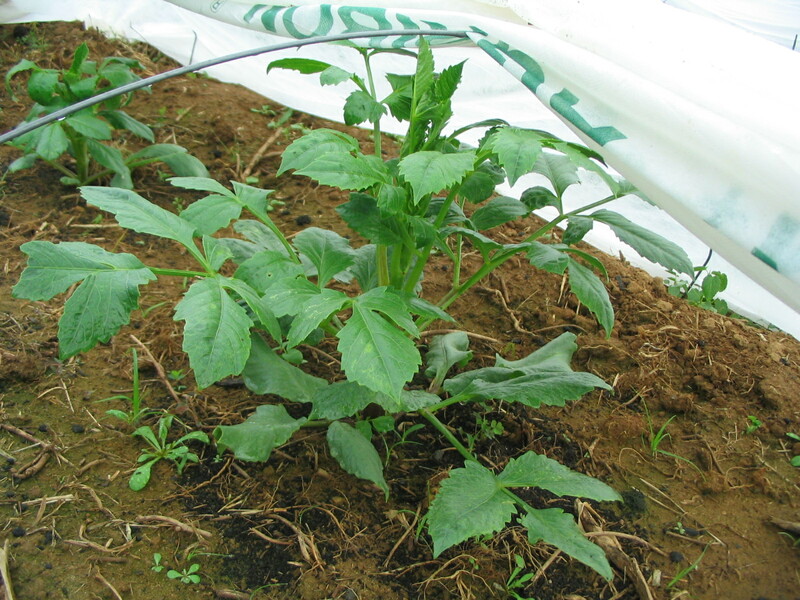 This dahlia plant is almost there!